Prepare the cake pan for baking. Take a round cake pan. Take a square piece of butter paper of the size of the cake pan. Fold it twice to get a folded square piece. Fold this to half so that it gets the shape of a triangle. Fold it further to get a narrow triangle shaped butter paper. Invert the cake pan and hold the narrow tip of the butter paper at the center of the pan. Hold it firmly and cut the paper which is not in the range of the pan. Cut it at the edge of the pan to get a sector type butter paper. Now unfold the butter paper. Turn the cake tin to right side and insert this cut butter paper into it. You will observe that the butter paper is cut neatly to the round size of the pan. Grease the pan with ghee. Place the butter paper inside the pan and apply ghee on the butter paper also. Keep this prepared pan aside till use. Remove the seeds of cardamoms from their shells and powder them finely. Keep this powder aside. Here I am using the convection-microwave-grill oven in which I will be using the convection mode only. Preheat the oven at 200oC. Switch on the oven to preheat and start the preparation—that time will be sufficient for preheating. Take a slotted plate and spread a thin cloth in it. Add the curdled milk along with water into this prepared plate. Bring together the edges of the cloth and press to remove excess water. Do not remove all the water in its entirety from the curdled milk. Take a lump and press between your fingers to feel the water in the Chenna. At this stage take this Chenna and weigh to get 500gms. Take a broad vessel and add this Chenna to it. Start kneading the Chenna with your palm till smooth. Knead till you feel that there are no lumps left in the Chenna. Even if tempted to put it in a processor, do not do it. Then add semolina and mix well. Now add the sugar and knead again. Knead till all the granules of the sugar get dissolved in the Chenna mixture. At this stage one can feel the water in the mixture—it will be wet and smooth to touch. Now add the cardamom powder and mix well. Just before adding this mixture to the cake tin add the baking powder. After adding baking powder mix well and spread this mixture in the prepared cake tin evenly. Press it lightly and spread the mixture evenly. Place this bowl in the preheated oven. Set the oven temperature to 190oC in “CONVECTION MODE”. After 15 minutes observe that the Chenna mixture starts rising. Due to baking powder it rises while being cooked. Bake for a total of 30 minutes at 190oC from the beginning. Grease an aluminum plate with Ghee and keep it ready. After 30 minutes, reduce the temperature to 150oC and bake covered with the greased aluminum plate. Bake at this temperature for 30 minutes. During this period the raised cake would slowly collapse and the baking process starts. Insert a toothpick to test for doneness. If the toothpick comes out clearly then it is done. If you find a sticky Chenna mixture on the toothpick then bake for some more time. Here the toothpick came out clearly. But to get a darker texture of the crust we will bake it for some more time at a lower temperature. The aroma of the cardamom powder fills the space. After 30 minutes, reduce the temperature to 130oC and bake covered for 30 minutes. 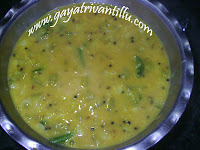 After 30 minutes you will observe that the PODO PEETHA has left the sides of the pan further. At this stage confirm by checking with the tooth pick. Keep this cake tin in the oven itself till it is completely cooled off and sets firmly. The heat in the oven makes it a bit more firm. Do not be tempted to un-mould it before cooling. If done, the cake would break. 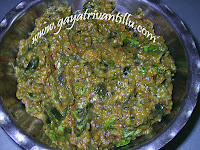 This PODO PEETHA is a tasty sweet dish which should be cooked in low temperatures only. 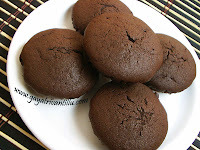 If you bake at higher temperatures all along, it will get dark color from outside but will not be cooked from inside. So take care to bake ONLY AT LOW TEMPERATURES. Do not remove all the water in its entirety from the Chenna. Bake the mixture in aluminum tin preferably for better results. If you don’t have aluminum tin you may use a heat-proof glass bowl too. Use convection mode of baking to get even color. Because of the baking powder the mixture rises first. After 15 minutes of baking it starts rising. Then after some time (30 minutes from the starting time of baking) you will observe that it stops rising and starts to dry up on the top. At this stage bake covered so that the top will not get dried up. After finishing baking, keep the dish covered so that the top will not get dried up. Let it cool completely covered in the closed oven only. This is an Oriya sweet dish. Serve this Chenna Cake filled with the fragrance of cardamoms to your family members and get all praises for the effort. Conventional OTG oven temperatures are generally not accurate. In my oven when I put it at 50o C and bake for two hours the dish comes out excellently. How accurate is this 50o C, I am not sure. 52 Recipes you may also like to watch.